On Friday [31 July 2015], the International Olympic Committee will select either Beijing or Almaty as the host city for the 2022 Winter Games. Tibetan civil society groups have submitted formal requests to prevent the Beijing Games on human rights rounds. The effort to block the 2022 Beijing Games illuminates a larger, more expansive problem in China wherein crackdowns on groups outside the Communist Party are commonplace. Human rights abuses and control of civil society remain at the forefront of the Tibetan struggle with China. Other minority groups as well, such as Southern Mongolians and Uyghurs, have asked the IOC to reject Beijing's candidature: read more. 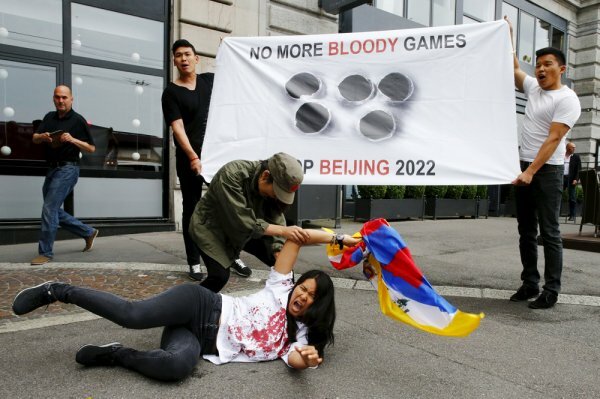 Tibetan activists and others are calling on the International Olympic Committee not to award the 2022 Winter Games to Beijing, saying China's human rights record after the 2008 Olympics in the Chinese capital worsened rather than showing a hoped-for improvement. The IOC will choose Friday between only two cities: Beijing and Kazakhstan's largest city, Almaty, after all other bidders dropped out for financial or political reasons. Both countries are frequently criticized over their record on human rights and press freedoms. Tibetan rights groups and human rights activists have written letters to the IOC, delivered a report to the IOC on human rights abuses and tried to disrupt the city's lobbying to try to prevent the decision from going to Beijing as it did in the 2001 vote for the 2008 Summer Olympic Games. "In 2001 what we saw was some optimism on the part of the IOC that the games might help to improve human rights in China. Exactly the opposite happened," said Alistair Currie of London-based Free Tibet, which is one of the groups coordinating the campaign by the International Tibet Network. Giving the games to China again is tantamount to saying "'you are a full member of the global community, you can receive all the honors and prestige that go along with that — that will embolden its approach to repressing human rights in Tibet and elsewhere," Currie said. The Foreign Ministry said in a statement Tuesday that the Chinese bid is intended to promote the Olympics in the country and would inspire more than 300 million Chinese to participate in winter sports. "While Chinese people are heartily looking forward to the holding of a successful and wonderful Winter Olympics, a few people with ulterior motives politicize the Games, which is not in keeping with the Olympic Spirit and will not be popular." Golog Jigme, a Tibetan activist, said he had co-signed a letter to the IOC last week along with groups representing other ethnic minorities urging it not to award another Olympics to China "out of disappointment and frustration." He broke out of police custody and escaped from Tibet in May 2014. He had been initially arrested after helping make a film that showed Tibetan nomads expressing their discontent over Chinese rule in Tibet just ahead of the 2008 Olympics, and alleges he was beaten severely and given electric shocks during detention. "What we have seen since 2008 is that there is more repression, Tibetan intellectuals are being forcefully disappeared and the situation in Tibet is getting more urgent every day," Golog Jigme, 46, said through an interpreter by phone from Switzerland, where he has applied for asylum. He said Tibetans faced more obstacles to traveling, even from village to village, and there was a big military presence that extended to monasteries and schools. Independent reporting from Tibet is virtually impossible because the government restricts access to the region. The Communist Party has governed Tibet since troops occupied the Himalayan region in 1951. Beijing says it has been part of China for centuries, but Tibetans say it was independent for much of that time. The campaign against Beijing becoming 2022 host city comes amid a wide-ranging crackdown on civil society, or groups outside of Communist Party control. In the past two months, authorities have rounded up more than 200 "rights-defender lawyers" and the activists associated with them, accusing them of being troublemakers. Dozens remain detained and may eventually stand trial. Highlighting the cases, an open letter signed initially by around 40 lawyers, students, professors, activists and writers within China and elsewhere and which has now become an online petition urges IOC members to reject Beijing's bid, saying China is facing a "human rights crisis with a scale of violations that is unprecedented since 2008." "The human rights environment is now generally considered probably the worst environment since 1989 because of the crackdown on civil society," Human Rights Watch researcher Maya Wang said. "This is not limited to the detention of individuals but also a significant hardening of ideology," which has become "more hostile towards human rights and democracy than in the past."